one owned unit, super condition. just serviced. Here's a four-wheeler that can do it all. The Vinson 500 Automatic has established its reputation as a tough sport-utility ATV that combines hard-working utility with incredible sport performance and styling. 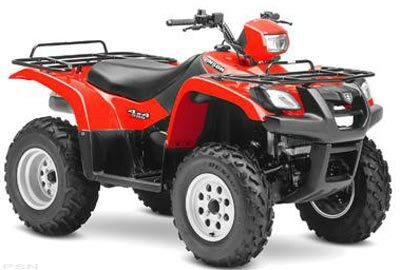 This Vinson earned "Best Sport Utility 4x4 ATV" ranking by ATV Sport. The key to its remarkable versatility is an unrivaled combination of features. The durable drivetrain provides simple operation with outstanding response that will appeal to the recreational rider and the utility user alike. The QuadMatic fully automatic, continuously variable transmission with a centrifugal clutch helps this Vinson deliver huge amounts of torque for monstrous pulling power. You select two- or four-wheel drive operation for maximum control and ease of use in a variety of environments. And advanced suspension systems help you safely conquer a tough trail and travel in all-day comfort. Best of all, whether you're hard at work or out sport riding, the Vinson provides you with lightweight agility not often found in a 500cc-class 4x4. For a real treat, check out the Vinson's list of standard features - everything from water-resistant front and rear storage compartments to an independently controlled auxiliary light. You'll see why the Vinson is the ideal four-wheeler for a hard day of work, or a weekend getaway.